Updated to add: Unfortunately, the Scrap Happy Quilting book is no longer in print. It is available as a PDF only. (HERE) If you’ve found this page through pinterest and want to know how to make an adorable Ticker Tape style quilt, see this free?Ticker Tape Owl Tutorial. My husband was nice enough to put up a shelving unit in the garage to store all of my totes of fabric. Each tote is a different color . . .I don’t think he realized just how much fabric I really have. But I’ve been good and been using from my scraps and stash when I made quilts lately. Well, I just linked to your blog from another blog, and saw the book. I LOVE elephants, so if I don’t win, I must buy this book. I have enough scraps to make an elephant in every color of the rainbow! Working now on getting them organized. Especially since I have given myself a “no new fabric until you organized” rule! Happy birthday! I’m only at 2yr and I feel like it’s been a lifetime (in a great way). I am always on the lookout for new containers for my scraps/stash. I tend to mix them together. Unless something is less than about six inches, I keep it all together. The elephant quilt is wonderful! Like the person who posted above, if I don’t win, I may have to buy he book just for that pattern! I still have the quilt top that you helped me put together 3 years ago waiting to be finished! I inherited some of my grandmother’s fabric in addition to all of mine in tubs & boxes & 2 bags of t-shirts to cut up into a t-shirt quilt. I LOVE the elephant quilt!! Maybe one day I will get it all done…. My scrap bin is over flowing. I need to go buy another bin or start using my scraps. Happy Birthday to another August person! Happy 5 year Anniversary!! 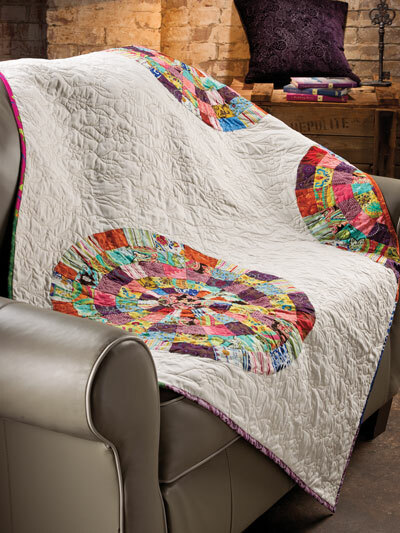 Love, love, love both of your quilts! I’d love to make them both. My scraps are spread all over! I still have not settled in from a move and then scraps from current projects started new piles. I’m not really sure how I want to organize them all. Maybe by color would be the best. Love scrap quilts and fingers crossed for a win or like the others, I’ll have to buy it, hehe. Everyone knows what UFOs are. I’m calling my scraps piles the DTH: Don’t Tell Husband! I’ve got scraps squirreled away all over the house. I need to take the pledge not to buy more fabric until I use up part of my horde. Furthermore, I have to agree with the others: The elephant is so cute that I’m going to buy the book just for that pattern. Unless I win, of course! Yeh, you could definitely adapt that Ticker Tape Elephant to be any shape. Really, any coloring book image might work. I’m glad you have a “path” in your sewing room. I had my scraps organized by color, but then I decided I might use them up more effectively if I just divided them into “lights” and “darks.” But yeh- there’s loads of scraps to wade through. Choices, choices. It seems like the “I need another bin” never ends at my house. You can do it! Almost all the kids are in school, right? Awe thanks. The book really has an assortment of styles and patterns. But yeh, I like the elephant too. I made a smaller prototype by sketching out the elephant on a 15″ block. The larger wall hanging quilt made it into the quilt. Awesome! And congrats on the 2 yr mark! You’d have a whole elephant herd! Great idea. That is a very nice set up for your stash. Great work, hubbs! Thanks for checking out Hexagons Made Easy. !Hi Clint! Have a great day! You deserve it. Love the book and the ideas. My scraps are is 2 gallon bags,not sorted,just in bags,where I put them when I finished a project. Love your quilts. I NEED to make them both!!! I have a soft spot for elephants! My scraps are in a dresser drawer, I pick out my favorites and give away the rest once a year. Nice book! Thanks for the giveaway. It’s a start, right! I have loads of UFO’s in ziplocs. Oooh- a dresser. That would make the stash look so much nicer than the rubbermaid/s I have going on. Happy 5th birthday! My scraps a currently kind of all over. i have a tub on the floor of my fabric closet under the shelves. But I also have a tub under my cutting table which is currently pulled out because we have been making doll clothes. Scraps everywhere! I have 2 bins in the garage full of scraps from all the quilts I made for my family. Then when my son shipped off to the Army, I used half of his closet for new fabrics and the other half is full of plastic bags full of scraps. And I have an open box next to my sewing machine that is filling with scraps. I need to go through my bins & bags to make your scrappy dresden quilt and the blue elephant quilt. OMG, the elephant is so cute! Thank you for sharing photos of your two quilts. If I don’t win, is it possible to buy the patterns from you? And, I agree August rules. Hubby just celebrated his birthday last Sunday too. He’s a pretty great hubby and Dad. My scrap bin is overflowing! It seems to grow even when I am using from it. I love the elephant quilt. OH MY!!! My scrapbins are color coded and there are 6 of them. Makes finding just the right color easy!!! :^) And that doesn’t include my scrap bin for floral strips, I think I have two bins full!!! Thanks for the opportunity to win your Fabulous book!!! Awesome book!!!!!! One that I either need to win or buy! I definitely have the scraps and your elephant would be the first one that I will make. 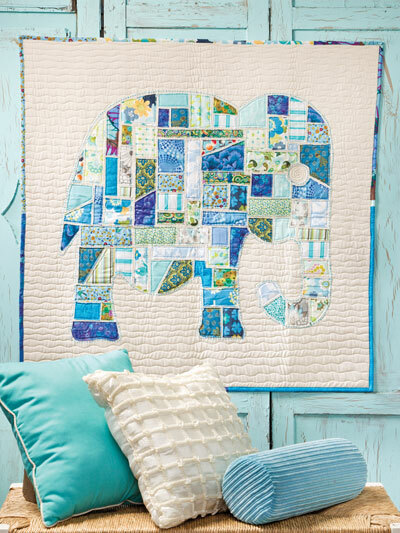 That elephant quilt is just too cute! I now have a whole zoo party quilt going on in my head! Awesome idea! I always knew you were super talented girl! Happy Birthday……twice! And, yes, August rocks! Thanks for the giveaway! The elephant is adorable and so are the other projects. I’m a very new quilter and my scrap collection is in one cubby (shelf) and now overflowing into a second cubby! You can always pick up patterns here in the online shop. Thank your son for his service! And Happy Birthday to your Mister. My scraps seem to multiply when I actually use them, too. That must be a scientific fact, right? Oh wow- you are rockin’ the organized system. Very inspiring. Some day…. The elephant is a big hit. I’m sure you’ll have plenty of scraps to make it. August kids are the best, right?!?! A whole zoo party would make a great nursery theme. That’s how it begins… careful! Wow. I LOVE the elephant. Such a wonderful quilt; especially to make for grandchildren. My scrap bin is still small and totally unorganized as of yet. I’m low on space in my sewing room so reorganization needs to happen again before I can separate the scrap bin into separate ones. I have too many scraps and need a system for them! I love your tutorials, very easy to understand. Keep up the great things you are doing, and a huge happy birthday to you. Umm, my scrap bin is a big scrap drawer and it’s full! I used a tiny portion of the greens recently though, I thought it would make a much bigger dent at the time. I just cut many 2.5″ squares from my scraps..nice and tidy in a box. Didn’t make a dent in the scraps though. My scrap bin overfloweth! I save every little bit of fabric. I need to organize it somehow, and definitely use it up 🙂 Happy 5th birthday! I have lots of scraps!! I don’t think I’ll ever use them all and the only time I do use some is in swaps!! Thanks for the giveaway!! I don’t have that many scraps but they are organized into bins by colour. My stash is growing! My scrap bin runneth over!!! I do my scraps by size…and keep them in seperate containers (the plastic tubs that cat litter comes in make great containers), all on a shelveing unit in the corner..from 3 inches up to 6 inchs, and I try to cut those scraps up pretty soon after they begin to accumulate in my basket..when the little container is full, I know its time to use that group for a scrappy quilt…..
Had I answered this question 2 days ago I could have said my scrap collection was under control. However yesterday I came home with a whole tub of scraps I need to make some charity quilts out of. Time to start hunting for ideas. I’d love to give that elephant a try. Happy 5th Birthday! My scraps are a disorganized mess. I do have strings and strips seperated, but the overall scraps? 😛 I really do want to play with them; maybe this winter will be THE winter to get some used up. I actually prefer to make quilts from my scraps rather than my yardage making my life more complicated no doubt ha. A gal never has enough fabric OR scraps!! Love my scraps in any container I can find. LOL! IT IS IN ABOUT 6 DIFFERENT CONTAINERS! STARTED OUT OK,BUT ENDING UP WITH LOTS AND LOTS! I would love to win this! I have about 8 containers of scraps sorted by colors! I have lots of scraps, I think I could literally spend the rest of my life sewing just with scraps and I might not run out! Congrats on the book and five years of your blog! Love both of your quilts in the book. Just finished a “dear jane”, using lots of scraps of repo civil war fabric and I’m ready to do something fun and bright! Would love to.make them both for some of my little grandbabies. My Scrap bin is absolutely chock full of odds and ends from years of storage. My number one goal for quilting this year is finding a variety of scrappy quilts to make with themes of cats, elephants, dogs, and 1930s style!